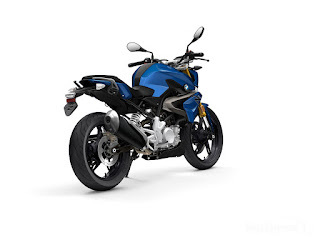 BMW TVS collaboration brings BMW motorcycle market in India. 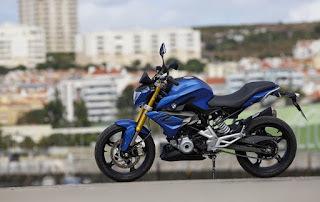 The initial maufacture is going to be at TVS, Hosur Plant at Bangalore.BMW G310, 313-cc single cylinder liquid cooled engine with 34 BHP with 28 NM Torque. 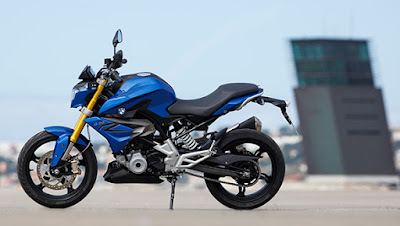 The BMW G 310 R is the essence of riding pleasure. It was built for pulsing cities and those who simply love riding motorcycles. Whether you're a tall or small rider, you’ll immediately feel at home on the BMW G 310 R! 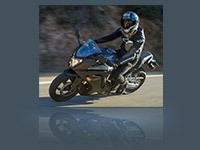 The bike is lightweight, yet a real powerhouse with its 313 cc engine. 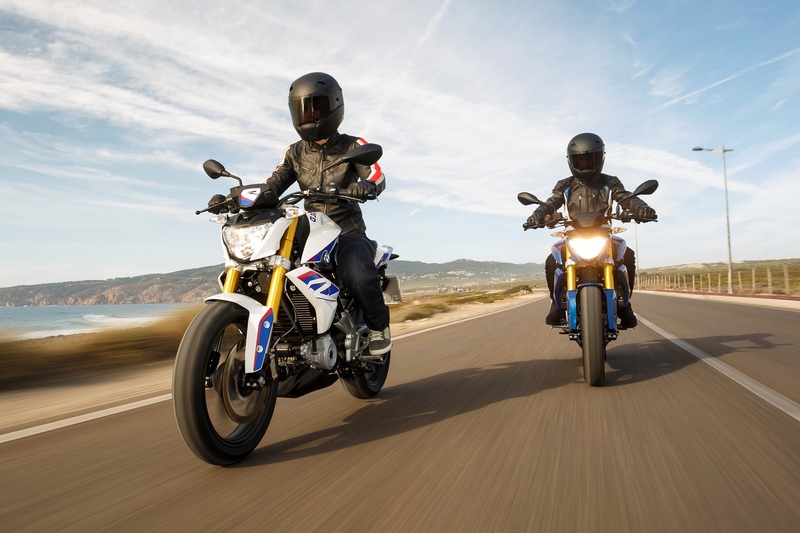 Get to work, the next hot spot or out of the city safely and reliably on the G 310 R. Premium quality, excellent workmanship and extraordinary technology ensure intense riding pleasure. Good looks unmistakably run in the family, the G 310 R clearly carries the S 1000 R genes. The sporty headlight fairing with powerful headlight, dynamic fuel tank trim and typical roadster proportions transform it into an eye-catcher on the street. The G 310 R is light and strong. The sporty seat emphasizes the roadster dynamic and gives the bike an unmistakable motorsport look. The gold anodized fork and brake calipers emphasize the workmanship of the machine. 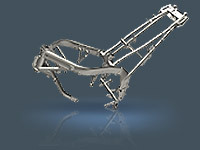 Another highlight is the detailed aluminium swing arm. The design ensures lightness and the struts offer stability. Wide tires grip to the road - providing confident riding pleasure. Ride stress-free and relaxed through the streets with the G 310 R. Even in the big-city hustle and bustle, you'll ride with confidence thanks to the successful layout of all of the control elements. 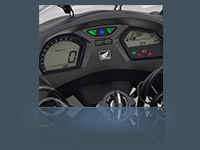 The ergonomic layout of the handlebars, footrest and control elements ensure a superb riding sensation. The G 310 R offers the right seat for all riders, providing stability. On any surface, the geometry and spring and damper tuning make it an agile city-hopper. 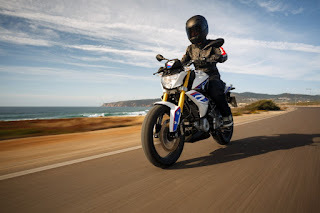 Whether riding in heavy city traffic, commuting to work or just getting out of the city on the weekend, with the G 310 R you'll want to ride on!!!!!!!!!!!!! 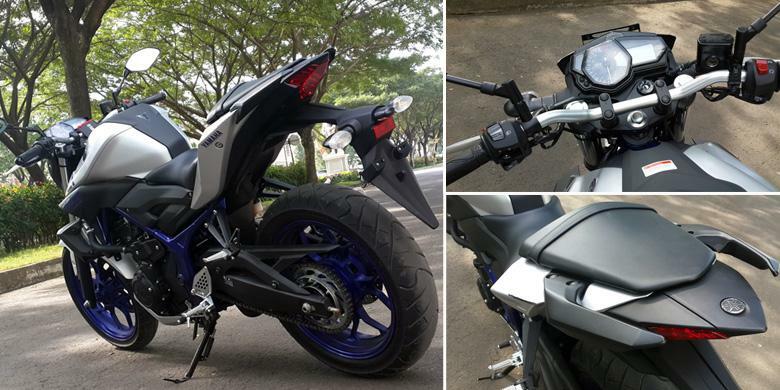 The machine like the Yamaha MT-03/MT-320 would be the first name striking to mind about the naked street. No doubt the new arrival has many bits to be tested the engine under the fuel tank belongs from a very prestigious family. 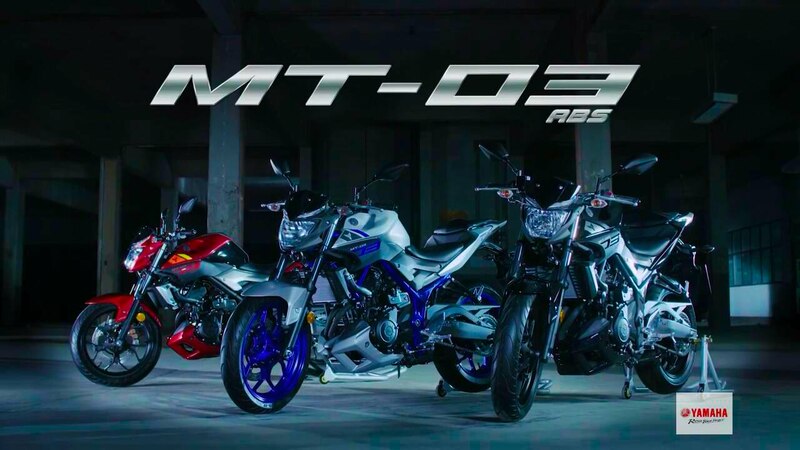 The R3's engine has been used for the bike, with its body components and styling nearly matching the MT-25, making it a true naked brother of the R3 as MT-25 was for R25. The design of the bike has been seen in the patented images, pointing directly to a non-faired R3, whose rear is same as the race machine. The front gets a street fighter look, making the bike muscular. 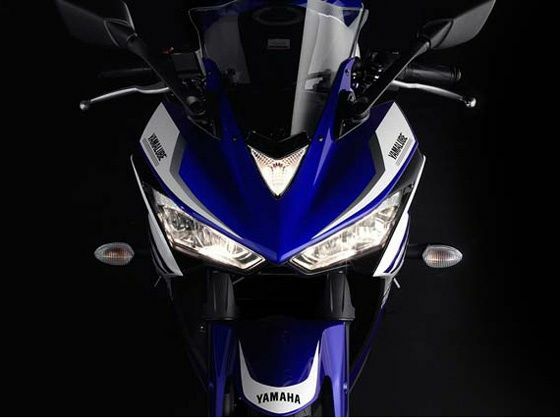 The bike comes with an FZ like headlight and front view, making them true cousins from the Yamaha street bike family. The engine delivers 321 cc, liquid cooled, fuel injected unit. It produces 41.4 BHP @ 10,750 rpm and 29.6 NM @ 9000 rpm. 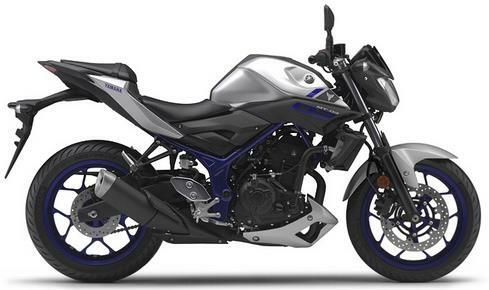 The twin cylinder machine changes Yamaha bikes, making it an economical choice among the riders. 6-speed gearbox, keeping the mechanical specifications exactly the same. The MT-320 will get the same brakes as its race sibling. The front comes with a 298 mm disc brake and rear with 220 mm unit. ABS is not there, like its faired brother YZF-R3. 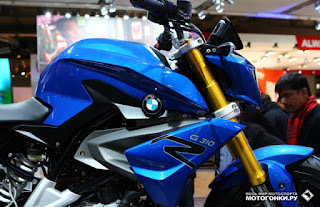 The suspension is telescopic just like FZ, monoshock for the rear. MT-03 will be available in 3 shades: - Red Metallic, Black Metallic & Matt Silver and the bike is expected to be available in a single non-ABS variant. The price is expected to stay close to INR 3,00,000 and MT-03 is expected to be launched in India at 2016 Auto Expo. The United States Motor Company (USMC) was organized by Benjamin Briscoe in 1910 as a selling company, to represent various manufacturers. It had begun life as the International Motor Company in 1908 in an attempt to create the first major consolidation within the industry with Maxwell-Briscoe and Buick, which did not succeed. International Motor was renamed USMC in December 1909. By the end of 1910 there were 11 constituent companies, each still headed by the individual who had built each company originally. During 1910, rumors surfaced that United States Motor Company was going to merge with General Motors, but Briscoe scotched the rumors by stating that any attempt to integrate General Motors into USMC would create chaos. An American branded motorcycle is coming on his way to India, will it change Indian Market? 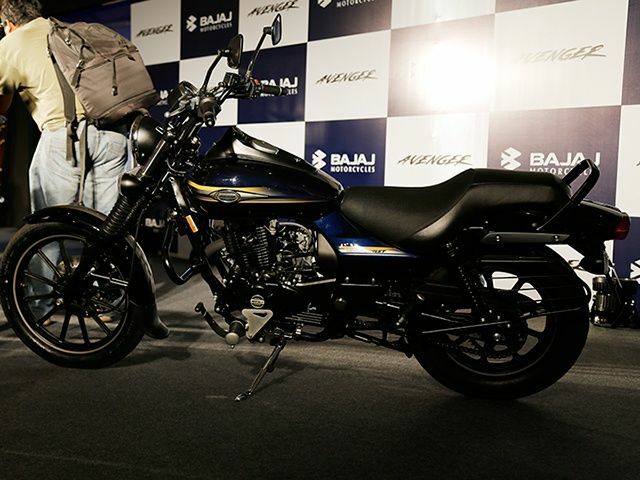 UM Renegade SportsS, the first model which is going to be launched in Indian market on February 2016. The manufacturing will be in India itself, this cruiser sport model comes with a 279-cc single cylinder liquid cooled fuel ignition. 26.6 PS with 8600 RPM. Torque 22.76 NM with 6300 RPM. Price - 1.70 lakh (ex-showroom). The new UM Renegade Sport S is its first cruiser motorcycle offering for the Indian market. According to the US manufacturer it has heavily localised the new Renegade Sports S with tyres sourced from TVS, Gabriel suspension bits and locally sourced headlamp, tail lamp and instrument console. 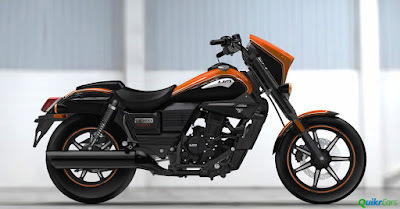 The styling of the motorcycle has been inspired from large cruiser bikes and the Renegade S that was showcased sported stealth black paint job with contrasting orange accents. The above styling and paint scheme should appeal to the youngsters and design influence from the Suzuki Intruder can be felt especially in profile. Awesome, I was thinking about this for a long. 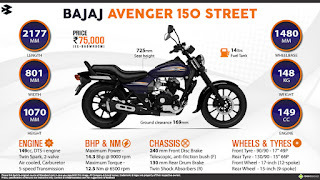 Why doesn't Bajaj over come the Avenger with an alloy. Now it really seems to be awesome and I can say one of my dream come true. On looks it feels like a Harley Davidson standing next to me. Definitely I can say like its a baby Harley for the Indian market. When Bajaj released Avenger model in 2005, the competitor was Yamaha Enticer. Enticer market went down when Avenger become the Indian cruiser. 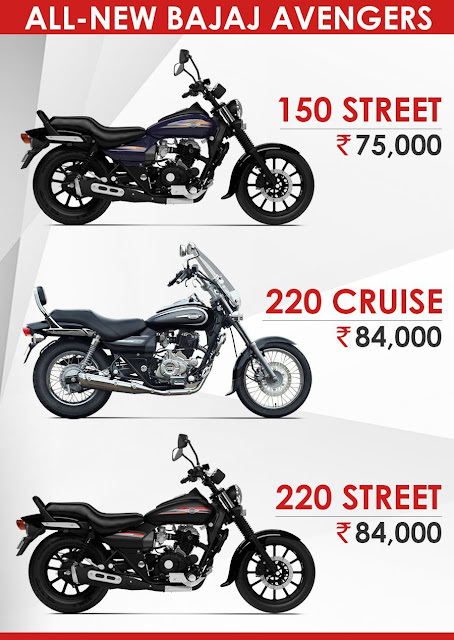 Today lets see the new launched Bajaj Avenger 150 Street, 220 Street, Avenger Cruise 220. While the Street 220 and Cruiser 220 are being offered at Rs. 84,000 (ex-showroom, Delhi), the entry-level Avenger Street 150 is priced at Rs. 75,000 (ex-showroom, Delhi). All three models come as replacement of the old Avenger. As they named Street, the bike is a real street performer. New Avenger is covered with Midnight Black with 12 spoke mat black allow. The thing is I can't even compare it with Harley Davidson, still as in Indian market it seems to be a Harley in all Indian hearts. The Vinyls plus the Fuel console within the fuel tank makes Avenger looks hot in market. 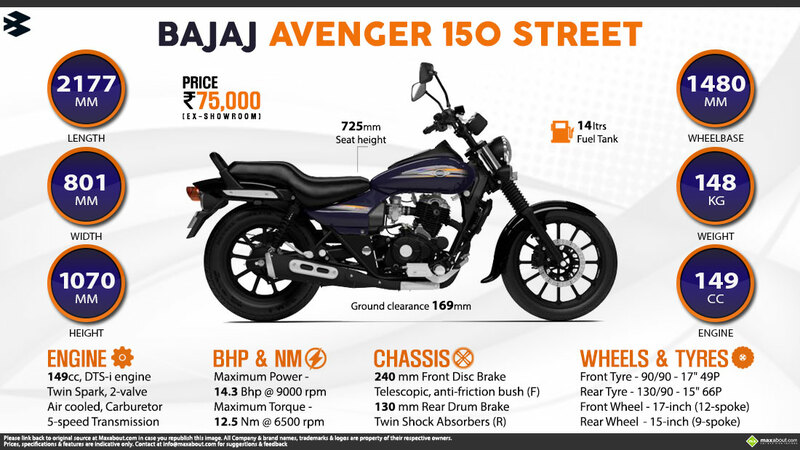 The Bajaj Avenger 150 Street measures 2177 mm in length, 801 mm in width and 1070 mm in height. It comes with a wheelbase of 1480 mm and gets a nice 169 mm of ground clearance. The bike weighs 148 kg. 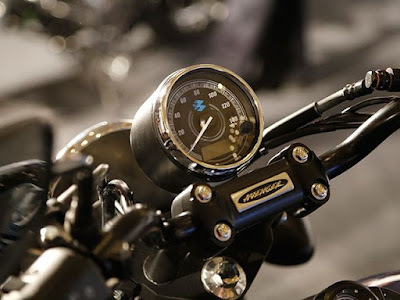 The same instrument console as the old Avenger 220 has been used on the Street 150 but with a small digital display for the odometer and the trip-meter. The chrome parts stay black whereas the upper ring of the single handlebar mounted pod has been kept chrome. The fuel gauge and other indicators have been placed on the fuel tank. 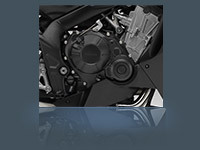 The most noticeable change on the young Avenger is its engine capacity. It gets a 149cc engine producing 14.3 BHP @ 9,000 rpm and 12.5 NM @ 6,500 rpm. The gearbox on the same is a 5-speed unit. The DTS-i motor has been used in a lower state of tune whereas the new generation of 150 cc engine produces 16.8 BHP from the same displacement. to get more about the new Indian street Cruise. The Honda CBR650F is a bike that will appeal to your practical and emotional sides. A truly fun ride at a great price, it’s what Honda does like no one else. Built around a smooth, inline-four engine specifically tuned for low-to-midrange torque, the CBR650F has a power band that’s suited for a wide range of riding styles. Weekday commuting, weekend sport riding, long trips, short hauls, solo or with a passenger— the CBR650F does it all. The CBR650F is built around a twin-spar steel frame, housing a 649cc 16-valve inline four-cylinder engine. This engine puts out 86bhp and 63Nm of torque through a six-speed gearbox. The CBR650F rides on 41mm forks at the front and a mono-shock in the rear with a seven-stage spring-preload adjust. 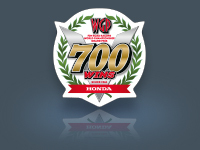 With an unprecedented unmatched 700 total MotoGP victories, Honda’s winning heritage stands far above any other manufacturer, just as Honda’s motorcycles stand out on the street. Our superior engineering and technology put our GP bikes in the winners’ circle and put you ahead on the street. This is a machine that offers an incredibly high fun factor while keeping real-world budgets in mind. Its ergonomics and performance will keep you excited and its price and features will keep your wallet. Honda pioneered the modern inline-four layout and we’ve never looked back. With smooth running and offering terrific performance, the CBR650F’s powerplant is one of our best. Fitting an after market free flow air-filter increase the percetnage of air in the air-fuel mixture. Thus, an engine tends to run lean and gets hot quickly therby affecting the overall perfromance. In order to compensate for the added air flow, you have to supply more fuel as well. This can be done by retuning the carburetor but in most cases requires up jetting it. Hence, it is vital that you reject the carburator. Increasing the bore won't help. You need to alter the size of the valves, and allow better engine breathing. Last but not the least, get all this done by a proffesional mechanic. It is now become a trend to customise regualr bikes with bigger rear tyre. Well it increases the stability of bike but the main factor in customising bigger tyre is, reduce in economy. And for regular bikes it may vary in the peroformance level too. Also, the stock tyres are quite lightweight and putting wider tyres will hamper the overall performance of the bike. Well feel it will be better if you upgrade to a more powerful bike than doing heavy modifications to the regular bikes. 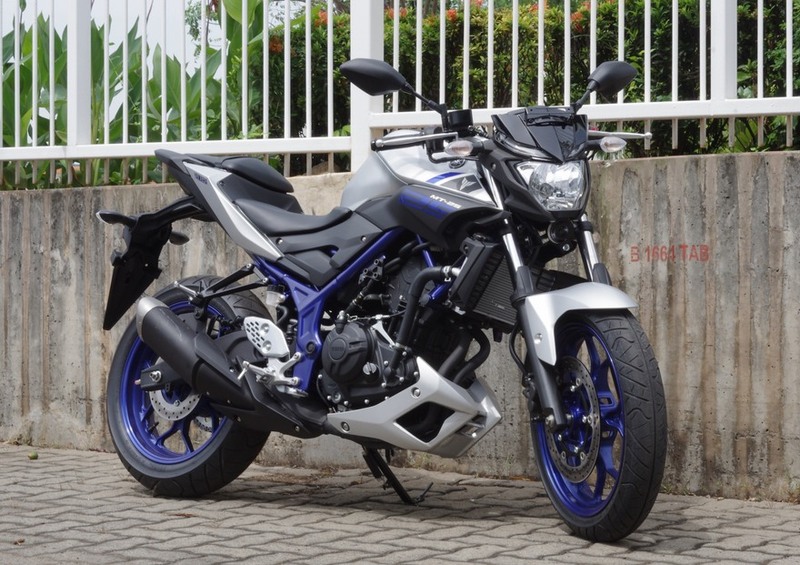 The Yamaha R25 has been one of those bikes that has generated lot of interest from the word go itself. Yamaha has confirmed about its plan of launching the new 250cc bike in our market, So let’s take close a look at the Yamaha YZF-R25 and what it has on offer. Let’s start with styling, one of the main reasons for the inquisitiveness about the R25 was its M1 inspired styling, the concept bike possessed. The Indian biker has a soft spot for a full-faired motorcycle and the R25 wouldn’t disappoint them on this front. 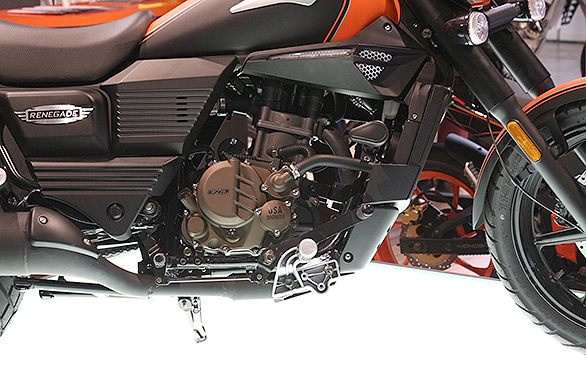 The R25 houses a 250cc, liquid-cooled, in-line, four-stroke, two-cylinder powerhouse that is mated to a six-speed gearbox. The eight-valve DOHC motor produces maximum power of 35.5bhp at 12000rpm while peak torque of 2.25kgm is made at 10000 revs. The R25's 166 kg kerb weight is supported by telescopic front forks and a monoshock rear suspension. Stopping power is managed by a single front and rear disc brake, which are mounted onto smart looking ten-spoke alloys finished in black. The R25 is available in three colour options – blue, black and red. MotoRRad CustoMIZ . Simple theme. Powered by Blogger.